A hidden note. A lost love. A second chance. Combined with the additional research she garnered through a trip to The National Sound Archives at the British Library in London, Kathryn Hughes created her fictional mental hospital, Ambergate Asylum. ‘Stories of Electroconvulsive Therapy, lobotomies, insulin coma therapy and patients incarcerated for almost the whole of their lives because they were deemed difficult or were a nuisance to their families. A diagnosis of ‘feeble-minded’ was enough to consign someone to an asylum indefinitely. The Key is a dual timeline story as we are taken back to a day in 1956 when Ellen Crosby arrived at Ambergate County Lunatic Asylum as a student nurse reporting for her first day of duty. Ellen is quite shocked by some of the methods used by the medical staff on the residents of the hospital. The treatment seems quite Dickensian to Ellen and she begins to wonder about what she has let herself in for. With no formal training, Ellen is to learn on the job but the cold-front of mental health care in the 1950s is an eye-opener to Ellen. Ellen becomes especially fixated on one resident, a young girl of a similar age to Ellen, who is committed by her father. Ellen is unable to see what is wrong with this girl and is openly concerned about the manner in which she is handled. There is a doctor who is working on methods to assist the people under his care but Ellen is not 100% sure that his methods are humane. As time passes Ellen makes a decision that will have a huge impact on the lives of others in future years. Fifty years later and Sarah is fascinated by the now abandoned Ambergate Asylum near her home. Working in the local library gives Sarah access to carrying out research for a book she is writing about the hospital, but for Sarah, the only real research comes from exploring the premises. Her mother has recently passed away and Sarah is living with her Dad for the time being. He is not happy with Sarah’s investigation into Ambergate and advises her to leave the past alone but Sarah is unable to do this. As she searches the corridors of the old building she finds a room full of suitcases, the remaining memories of past residents. Sarah searches each case, recording their content for her research but in one she happens upon a devastating piece of information that takes her breath away. Sarah becomes obsessed with unearthing the truth behind these tragic events, leading her down a very unexpected and quite distressing path, but yet one that will expose the truth and will hopefully put right a terrible wrong carried out at Ambergate over fifty years ago. This is exactly what Sarah does as the past and the present become intertwined in this story of a young woman who’s actions would unwittingly affect her future and that of others for over half a century. Kathryn Hughes writes beautifully. The narrative just flows as you find yourself getting so caught up in the story. We all have heard the stories of the old institutions and how folk were left in these places and forgotten about for years, many times only leaving in a coffin. Thankfully the attitude to mental health has made huge advances over the years but we must always remember that it wasn’t that long ago when life in these places was a traumatic experience for most involved. 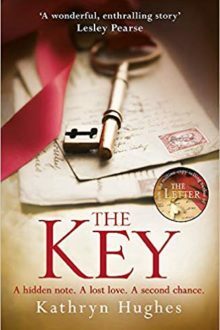 The Key is a compelling and fascinating read, one that will stay with you long after you turn that final page.